(NaturalNews) The U.S. Food and Drug Administration masterminded an illegal international abduction of an American citizen as part of its illegal war against natural cancer treatment products, NaturalNews can now reveal. (This is an exclusive NaturalNews story, so please credit NaturalNews as the source.) Gregory Caton, an herbal product formulator living in Ecuador, was kidnapped at gunpoint in 2009, forced onto an American Airlines commercial jet in Guayaquil, and flown to Miami as part of an "extraordinary rendition" operation which involved U.S. Food and Drug Administration officials knowingly providing false information to Interpol (among other crimes) and recruiting what appear to be FBI agents who illegally operated on the ground in Ecuador. This revelation fits the pattern of rising criminality throughout the U.S. federal government, where even the ATF was recently caught running guns into Mexico and specifically arming Mexican drug gangs as part of its now-exposed Fast and Furious operation (https://www.naturalnews.com/032934_ATF_illega...). NaturalNews has now acquired documentation proving that Greg Caton was illegally stalked and then abducted in Ecuador by U.S. State Department agents who bribed local officials and military personnel in Ecuador to help carry out the criminal acts. Some of those co-conspirators within the Ecuadorian government are named below. If you leave Ecuador, your exit is processed through immigration. This is unlike the USA, where you can fly out of the country without passing through immigration checkpoints. In Ecuador, they have tighter controls on people leaving the country, and they record the date that you left. So any person leaving the country through any lawful process must have an exit event recorded on their migration movement report. The movement report of Greg Caton, however, shows no official recognition that he ever left Ecuador in 2007. That's because he was kidnapped by U.S. officials who violated international law and violated Ecuador's own legal process in forcibly removing Greg Caton from Ecuador. This document proves it. Notably, Greg Caton was not doing anything considered illegal by Ecuador. In fact, the idea of creating your own herbal salve products using plants from Mother Nature is considered perfectly normal throughout Central and South America. The idea that someone could be branded an "international criminal" for selling a plant-based cancer salve is considered ludicrous! Ecuador actually welcomed Greg Caton because he was manufacturing his Cansema product there, hiring workers and providing jobs for Ecuadorian locals. The U.S. Food and Drug Administration, on the other hand, which is a criminal racketeering organization that protects the financial interests of the drug companies, has always tried to paint herbalists as criminals (see below). To read it correctly, you need to realize that Ecuador uses the DD/MM/YYYY format for dates. So 02/09/2007 does not mean February ninth, but rather September second. "Fecha" means date, and you can clearly see the date on this report is September 7, 2011 (it was produced just last week, when Caton returned to Ecuador). The last movement recorded on this document is from September 2, 2007, showing he entered Guayaquil from the United States four years ago. Importantly, there is no record that Greg Caton ever left Ecuador when he was abducted by U.S. State Dept. officials. In fact, as far as Ecuador was concerned, Greg Caton had never left the country at all. Of course, in reality, he has spent roughly the last two years sitting in prison in Louisiana and Texas, because once U.S. officials successfully kidnapped and flew Caton back to the United States, they threw him in prison to serve out the remaining two years on his probation sentence. Caton was convicted of selling "unapproved drugs," you see. And those unapproved drugs were none other than the plant-based anti-cancer herbal salves that have, for decades, infuriated both the FDA and the AMA. These are the same herbal formulas advocated by Harry Hoxsey, who was intimidated and threatened by the AMA many decades ago (www.HarryHoxsey.com). Hoxsey is the cancer cure pioneer featured in the book When Healing Becomes a Crime co-authored by Kenny Ausubel (http://www.amazon.com/When-Healing-Becomes-C...). It is an extraordinary book about how the medical establishment condemned, threatened and then outright criminalized the efforts of Hoxsey to offer an alternative cancer cure that really worked. Not much has changed in almost a hundred years, it seems, as the FDA is still engaged in outright criminal behavior in order to achieve its aims of destroying any person who attempts to sell cancer cures that are safe, effective and affordable. This is why the FDA went after Greg Caton in the first place, and the lengths to which the FDA has gone to persecute this individual demonstrate just how terrified the agency really is of people who try to educate the public on the truth about cancer. What truth is that? Cancer can be cured. Numerous cures already exist right now, and Greg Caton offered one of them in his Cansema product. There are many others. As part of its effort to criminalize Caton, the FDA conspired with the U.S. Dept. of Justice to provide false information to Interpol, the international criminal investigation group. Through this false information effort, the FDA managed to get Greg Caton listed as an international fugitive who was wanted for "drug-related crimes." He was even given a "red notice" status which is normally reserved for mass murderers, serial rapists and escaped war criminals. 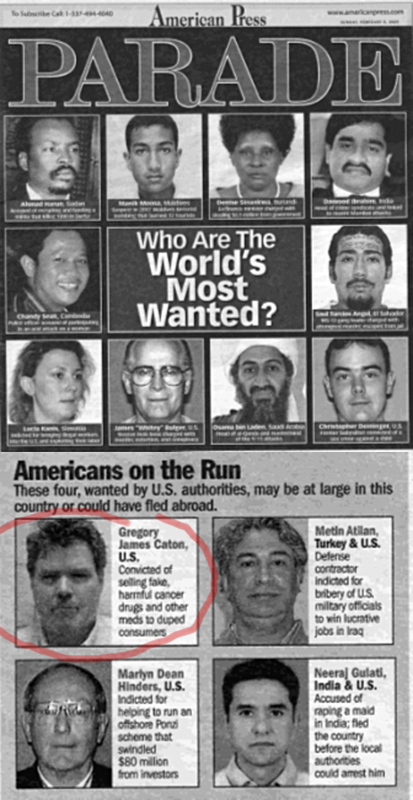 NaturalNews contacted Interpol to inquire as to how Gregory Caton, an herbal formulator violating nothing more than probation, could have been listed with Interpol as a wanted international fugitive with a so-called "Red Notice" -- Interpol's highest alert level. This is the kind of alert level someone like Osama Bin Laden might normally merit with Interpol. We were told by the U.S. Interpol office (under the DOJ), "those individuals placed on a Most Wanted List are the ones who have allegedly committed the most heinous of crimes for a very long period of time." In other words, the Interpol "Red Notice" designation -- which was applied to Greg Caton's listing -- is never applied to people who merely skip probation. The Greg Caton listing with Interpol, NaturalNews learned, was off protocol. Someone, it seemed, had managed to exploit the DOJ / Interpol system to get Caton listed as an international fugitive when he was merely guilty of skipping out on the last 18 months of his probation. To make the Interpol listing sound more serious, paperwork was submitted to Interpol decision makers that listed Caton's offenses as "drugs related crimes, fraud." As you can see, this list features mass murderers, Ponzi scheme operators, defense contractor bribery con men, rapists and other outrageous criminals. And then there's Gregory Caton, who is falsely described as "convicted of selling fake, harmful cancer drugs... to duped consumers." Gee, that actually describes the entire chemotherapy industry! As a point in fact, Greg Caton was selling real cancer cures to fully-informed consumers, many of which had their lives saved by Cansema! It is through the FDA's outright lies and false propaganda efforts that Greg Caton even made it onto this "World's Most Wanted" list. But of course, the U.S. government is all about promoting counterfeits while attacking anything that's real. I wrote a whole story on this called the Counterfeit Culture (https://www.naturalnews.com/033491_counterfei...). Remember when the U.S. government recently raided a small company that manufactured gold coins (Liberty coins) and then claimed that gold coins were "fake" while paper dollars were real? (http://www.infowars.com/feds-may-seize-liber...). This is the kind of "reality reversals" in which the U.S. federal government is now steeped as part of its runaway criminality. If all this continues, we're going to see the World's Most Wanted list soon listing organic gardeners, raw dairy farmers and non-GMO seed sellers. They're all criminals in the evil eyes of the FDA, you see. Now, thanks to the migratory movement report from Ecuador, we now know with certainty that the U.S. government plotted and carried out the criminal abduction of Gregory Caton from Ecuador, violating U.S. law and Ecuadorian law, and completely denying Greg Caton his rights. If the U.S. had followed the law, it would have worked through the legal system in Ecuador to apply for extradition, then it would have argued in favor of extradition during Ecuadorian court proceedings. This is the normal extradition process pursued under international law. But the U.S. government, of course, completely bypassed lawful extradition proceedings and simply kidnapped Greg Caton using armed Ecuadorian military personnel who were bribed into taking part in this insidious FDA plot. • U.S. agents convinced Ecuadorian officials to create a warrant by a "Fiscal" (prosecutor) of Migration with investigative matters, even though Greg Caton did not commit any crime in Ecuadorian territory. • Judge Angel Rubio, the presiding judge in Ecuador, after reviewing the facts of the case, issued an immediate release order for Caton. In other words, the result of the extradition hearing was that Judge Rubio did not find any evidence against him. There was no evidence presented that Mr. Caton had done anything that would warrant his extradition. This order was never fulfilled, as U.S. agents simply threw Caton onto an American Airlines airplane and fly him out of the country (illegally). Caton legal rights as a legal permanent resident of the country of Ecuador were completely violated. • The police officer, Captain Wilson Reyes of the Ecuadorean National Police, deprived Caton of his freedom for more than 24 hours without the benefit of trial, imprisoning him for a period of time that exceeds the time allotted by Ecuadorian law, before the benefit of his extradition hearing. He did not allow Caton any change of clothes, or access to food. • No one read Caton his rights in his native language, as required by Ecuadorian law. Instead, Reyes relied upon information from an Interpol alert that stated that Caton was fluent in English, Spanish, and Russian – none of which is true. Caton's only language of fluency is his native one: English. • Greg Caton was put on an American Airlines plane -- Flight # 952 on Friday, December 11, 2009 -- thereby illegally deporting him. When Caton asked Reyes where they were going, after being taken from the prison in Guayaquil, Reyes stated in clear, understandable English that he was being taken to see the judge for his hearing. Instead of taking Caton to his hearing, Reyes took Caton immediately to Guayaquil International Airport. He was deported on a non-stop flight from Guayaquil to Miami. About an hour before the flight, Caton was able to acquire cell phone and notify his wife of what was transpiring. Calls were made to Caton's legal team which resulted in none other than the Tenth Judge of Criminal Guarantees, Dr. Edgar Salazar Vera, who requested that Caton -- who by that time was on the tarmac -- be immediately released. The plane's pilot refused to release him, claiming to be on American territory, even though the plane was clearly sitting in Ecuador. Thus, an American Airlines pilot refused to honor the orders of an Ecuadorian judge on Ecuadorian territory. • Greg was escorted by two Ecuadorian policemen, one of whom was Capitan Wilson Reyes, who himself refused to obey the order from an Ecuadorian judge. Thus, Reyes committed treason by opting to follow orders by the U.S. State Dept. over those of an Ecuadorian federal judge. In addition to U.S. State Dept. agents who took part in the illegal abduction and kidnapping of Gregory Caton, FBI agents were found to be involved in a manhunt to find Greg. While driving my car taking my 16 year old son to school, I was suddenly intercepted by a pickup truck: double cabin, light beige, with license plate number RYA 003. In the vehicle were 4 National Police Agents, dressed in civilian clothes. They told me they had received a report of a stolen grey Volkswagen with Pichincha license plates. I showed them the necessary documents which confirmed I was the owner of the car. I showed them my ID, passport, car documents. After that they asked for my residency papers which I showed to them and they saw that everything was in order. Since all my documents were in order, I thought I could go home. That’s when they told me I had to be detained and go to the Migration Office so they could check and compare my documents with theirs, even though I had presented all documents and all were clear and up to date. These agents said that this was routine procedure, making me sit in the back seat of their pickup truck; one agent sat with me while another one drove. Meanwhile they put my son in the back seat of my car; one agent sat in the back with him and another one drove. When we entered the Migration Office property, the doors were opened immediately to allow the vehicle to enter. The Migration Office Police recognized the agents’ faces. Once the two vehicles entered, we drove to the back side of the building through the parking lot and stopped there. They left me inside the vehicle with the doors locked, telling me I had to wait until they compared my documents with Migrations documents. They then placed four heavy black boxes on the ground on the front, sides and back of car. Meanwhile, my son was locked up in my car separated from me. Thirty minutes later, after sitting inside the car without knowing what was happening, they opened the door and told me to get out. A man approached, he looked like some kind of Migration Office authority dressed in a blue suit. He was accompanied by three Ecuadorians wearing black bullet proof vests with white FBI letters on them. The man in the suit was holding a folder and he approached me, opens the file and I notice that the first page was a document with a US Consulate or Embassy emblem on it with the heading written in English. I could see they were documents of deportation and arrest for Gregory James Caton. At that moment a man, evidently American, comes out of the Migration building wearing a light brown suit. I realized this guy had something to do with the Ecuadorian agents; he spoke to them in Spanish and ordered them to put away the folder immediately. Immediately after that, the American ordered me to go back to the vehicle and asked me in English if I knew Greg James Caton and if I knew where to find him. He said he didn’t have a problem with me and to give them Greg’s phone number. I told them I knew nothing and that even if I did, I would not tell him. This American grabbed my cell phone from my hands and gave it to the Ecuadorian agent that was dressed in a blue suit; he checked all of the numbers that were on my cell phone while the other Agent wrote them down. I was getting calls on my cell phone and the Agent was answering them. They once again put me inside the vehicle and the agent who had been at the driving wheel kept on saying, be patient, be patient and wait. The reason why they did that was to give the other agents time to get to Greg James Caton’s home in Urbanizacion Torres del Salado. That is why they took my cell from me so that I could not communicate with Greg. They saw I was irritated; I told them that all of this was going directly to the Minister of National and International Security [NAME REDACTED]. When they heard this, these police agents and the American gave me back my cell phone and they said that they didn’t want any problems with anyone. They let me go at 17h30. I will add that the Ecuadorian agents seemed quite familiar with the American; they demonstrated that his wish was their command. After this, I immediately called [NAME REDACTED] who works with me as a translator. I told her what happened. Immediately she went to Caton’s residence where she saw a brand new dark blue Ford Explorer with black windows and without license plates that had 4 agents inside, one of them wearing white FBI letters. Two other brand new silver pickups with dark windows, double cabin, without license plates with four agents inside joined them and parked in an outside of Greg James Caton’s home. The guard at the entrance to the Ubanizacion said that the agents were there to look for Greg Caton because his visa had expired, which is false because all of his documents are in order. What all this means is that the FDA is masterminding a shockingly large-scale international crime ring that uses government agents, Interpol, U.S. Marshalls, propaganda magazines and many other resources to carry out abductions, bribery, kidnapping, intimidation and other crimes -- all in the name of protecting pharmaceutical profits. It is an extraordinary true story that the mainstream media absolutely refuses to cover. You will never see this story covered in the old dinosaur media. Only the alternative press dares conduct actual journalism in questioning the FDA's actions. NaturalNews has been leading the way on this issue, exposing the criminality of the FDA, producing the documents, gathering the interviews and testimonials, and showing the true nature of this outright mob-style criminal gang known as the U.S. Food and Drug Administration. Every fact, every document and every allegation leveled in this story is provably true. This can only lead to the conclusion that the FDA is a rogue terrorist organization operating far outside the bounds of U.S. law, and yet it is funded by U.S. taxpayers, many of which are targeted as victims of the FDA's intimidation schemes. The FDA knowingly engages in felony crimes (abduction, kidnapping, bribery, etc.) in order to achieve its aims, it knowingly provides false intel to Interpol in order to unlawfully frame and innocent person, and it does all this for the sole purpose of protecting the cancer industry in the United States, which is a multi-billion-dollar industry that preys upon the pain and suffering of the American people. This same government also recently raided Gibson Guitars at gunpoint, seized millions of dollars in "illegal wood" and then ordered Gibson to fire its U.S. workers and move its operations overseas (https://www.naturalnews.com/033454_Gibson_Gui...). This is all part of the U.S. government's program to destroy the U.S. economy and create widespread unemployment in America (https://www.naturalnews.com/033506_Gibson_Gui...). It's impossible to know how many innocents have been assassinated, intimidated or falsely imprisoned by the FDA and other federal agencies, but you can bet it's a disturbingly large number. A government that was once created to serve the People has now devolved into a gang of criminals who routinely violate the law in their quest for more police state powers over everyone else. The outright criminality of the conspiracy leveled against Greg Caton -- involving the FDA and State Dept. -- can of course be redirected to anyone seen as a threat to the ever-growing power base of the government itself. Governments are like cancers, you see -- they grow like tumors, expanding their reach until they take over and kill the host. That's why America has no real future under the current system of criminal government. Freedom is all but lost, and it can only be restored when the Republic is restored. A Republic is a nation ruled by law, not by tyrants. And America is nothing like a Republic anymore. It has devolved into a police state nation ruled by a cabal of bureaucratic criminals who carry government badges and collect government paychecks. The greatest threat to the health and freedom of the American people is government itself, far dwarfing any threat created by "terrorists." In fact, as I recently published here on NaturalNews, there's little doubt the federal government is currently plotting its own terrorist attacks against the American people in order to continue its fictitious narrative about "terrorism threats" and convince the people to give up yet more freedoms (https://www.naturalnews.com/033545_government...). Such attacks, I have publicly predicted, will most likely take place on a Monday or Tuesday. Because, think about it folks: If the U.S. government would run illegal kidnapping and abduction ops in Ecuador, do you seriously think it wouldn't plant nuclear bombs in U.S. cities and kill a few million innocent Americans if it meant usurping more power? Do not be timid in your understand of this issue: All governments are inherently evil in that they incessantly seek to grow their power by any and all means, including the deaths of innocents. All governments see their power as far more important than your freedoms or rights, meaning governments are capable of anything if it means protecting their power or their interests. The FDA is right on board with this program of total tyranny over all things related to health and medicine. It is, technically, a Nazi-style secret police organization that seeks to expand its power at any cost, including running a domestic spy network made of women who are trained in KGB-style infiltration techniques (https://www.naturalnews.com/033428_FDA_secret...). Knowing the history of human cruelty in recent years (World War II, for example), it is not a stretch to imagine armed FDA agents swarming across the countryside, targeting home gardeners and small organic farmers, then lining them up against their own barns and shooting them in the head, Nazi-style, then dumping them into makeshift graves. This is what's coming if we don't put a stop to the FDA's repugnant and willful abandonment of law and its use of force and intimidation to achieve its political aims. There, you can find action items to help resist the FDA's criminal efforts and help restore food freedom in America. Also, please frequent the Alliance for Natural Health (www.ANH-USA.org) which is helping spread the word about the FDA's dark agenda while pushing for serious regulatory reform. The ANH is doing outstanding work on the legal front, and they deserve your support. In addition, share this story on NaturalNews and raise awareness about these issues among your friends, many of which will no doubt fail to even believe this is happening at all. The American people, for the most part, simply cannot grasp the depth of enslavement under which they now labor. They live out their lives under the false belief that the FDA is somehow "protecting" them and make their food safe, while in reality, the FDA is betraying them at every opportunity and actively working to criminalize and imprison the very people who have made available natural cancer cures that really work. I can only pray that FDA operatives and bureaucrats will soon be arrested and prosecuted for their crimes against the American people. This is an agency so steeped in criminal activity and a psychopathic mindset that it is beyond saving. There is no way forward now other than the dismantle the entire FDA, convict its leaders of crimes against humanity, and find a better way to help protect the food freedoms and natural medicine options for American consumers. Every day that we allow the FDA to continue operating is another day that innocent Americans are murdered, abducted or threatened by this rogue "terrorist" agency. Shame on those many members of Congress (including ALL Democrats) who actually voted to give the FDA even more money and power under the Food Safety Modernization Act, which was passed into law last December.